The hit sitcom Seinfeld produced any number of classic episodes during its nine-season run on NBC from 1989 to 1998: “The Soup Nazi,” “The Puffy Shirt,” “The Contest,” and more. And now a Pittsburgh-based fan named Doug Keener has created a ghoulish, blood-soaked coda to the series that could be termed “The First Person Shooter.” In this quasi-episode, which combines elements of the sitcom with the popular 1994 video game Doom II: Hell On Earth, an unseen, gun-toting psychopath stalks the halls of Jerry’s iconic Manhattan apartment building and picks off Seinfeld and his pals one by one. It could almost be considered a mercy killing, though, since the once witty characters have now become mindless automatons who march stiffly around the room spouting catchphrases from the series. “These pretzels are making me thirsty,” Kramer mindlessly observes, seconds before his demise. Who could be behind these killings? Newman, perhaps? No, that scheming mailman is killed off here, too. Perhaps someone unwisely entrusted “Crazy” Joe Davola with a firearm. A Doom/Seinfeld crossover might seem far-fetched, but Doom II came out during Seinfeld’s run, so the title character could have played the game on the computer in his apartment. Nothing like a first-person shooter to relieve some Bania-related tension. In the description accompanying the video, Keener says that this strange project was a labor of love: “I am a massive fan of Seinfeld. The characters were put into the replica as a bonus to add to the tribute. 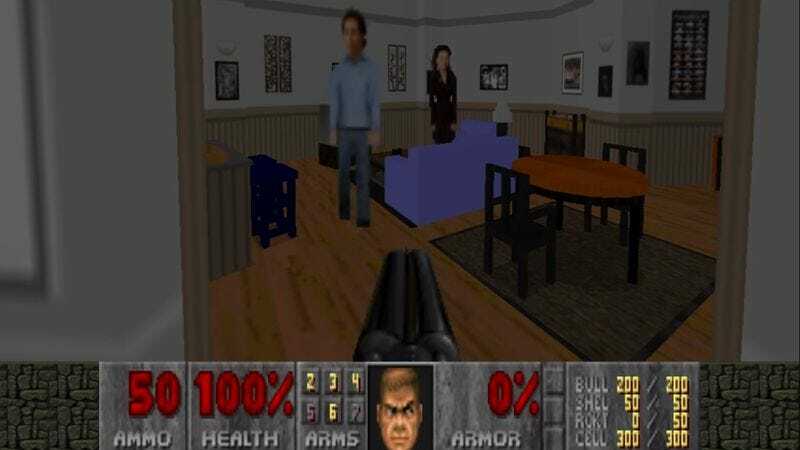 The only reason they are killable is because I wanted to keep it in traditional Doom fashion, because what is Doom without violence and death?” To that end, Keener put over 100 hours of work into creating a 3-D simulacrum of the Seinfeld apartment and creating “death animations” for the major characters. The level of detail here is staggering. The opening sequence begins with an instrumental version of the Greatest American Hero theme that George once used on his answering machine. From there on, the familiar Seinfeld theme is heard on the soundtrack. The apartment is rich with details, too, including all the props that fans will remember: the never-used bicycle, the much-used couch, and various cereal boxes and Superman merchandise. For those interested in exploring the customized map further, it’s available for download on Google Drive. Serenity? Never.